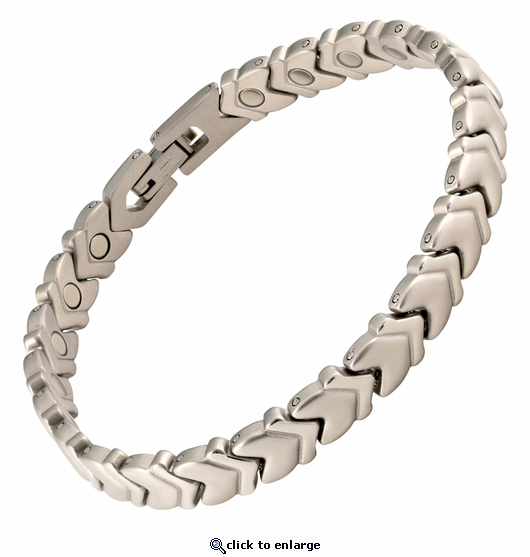 This is a stylish silver solid stainless steel magnetic bracelet. This magnet bracelet has matte silver hearts with shiny silver accents, and is about 1/3" wide. It features a powerful & permanent 3300 gauss neodymium rare earth north facing magnet in each link. Great product and great customer service. I ordered the wrong size and with a simply email request to have extra links sent, I had an immediate response back that the links would be sent no charge! They came within a week. Easy enough for a jeweler to add them in without having to send the entire bracelet back. The bracelet is way too big so I haven't had a chance to wear it yet. I love the look of this bracelet. I have gotten compliments from strangers who see it while I am out. The fact that the magnets ease the joint aches I am getting due to aging is a bonus. If you are on the fence, get it. You won\'t be disappointed. I have a finger that is really messed up and I have been to an orthopedic doctor, with it... He gave me an antibiotic salve to rub on several times a day. Some days the pain is really bad and some days it is less depending on what I do and how much I use that hand. I ordered the magnetic bracelet to give it a try... at this point I will try most anything. After wearing it about a week, I could see a difference in the pain and swelling. I do not think it will ever be back to normal-- but the bracelet does seem to be helping. I know there are no medical promises for my bracelets, but I bought 2 bracelets because I have been having issues with numbness in my hands due to carpal tunnel and they have helped that issue. I think there has been some improvement with the arthritis in my hands, not as much as I hoped. I put both of them on each morning and have found my hands do feel better all day. The fit is good. Reply by MJS: You may want to consider, if it is comfortable for you to do so, wearing while you sleep and not removing each day. I love my bracelet, but wish I had sent it back to have a link taken out as they made it too big, and it cost me $10.00 in the store to get it fixed. Hopefully it continues to help with my wrist issues.Reply by MJS: We sent the bracelet for the wrist size you ordered, making the bracelet a bit larger than the wrist size you chose as we explain on site. You apparently ordered the wrong size. We were glad to re-size at no charge if you sent to us. We are glad it is helping you. Love the bracelet, works very well.I have purchased two and am very happy with them. This is my third purchase from this site and I am very satisfied with the pieces I have received. The bracelet is very attractive and durable. I'm not afraid to get it wet while I'm washing my hands! I feel it is helping my painful shoulder while I'm wearing it. I received my bracelet within 4 days of ordering it. I was impressed at the service. I have worn my bracelet ever since. I am pleased with how it looks and feels. I would recommend it to a friend. I have worn magnetic jewelry for many years to help with my arthritic elbow and shoulder. My previous bracelet broke a few weeks ago and like before I thought the pain relief was all in my head. I would wake up in the night unable to move my elbow. I found this website and ordered this beautiful bracelet and have been pain free from the very first night. I swear by magnetic jewelry. It has been a life saver for me. I bought two of these lovely bracelets-one for each wrist, to help with arthritis. The first day I put them on, I didn't notice any difference in my arthritis, but when I went down the stairs I immediately noticed that I was not dizzy - a problem I had been having for several months. I didn't expect that result at all! After wearing them for a few weeks my arthritis pain is now greatly diminished. This is beautiful jewelry and I would be happy with it even if I had not experienced such great results. I really like this bracelet. I first purchased a magnetic bracelet while on vacation in Hawaii. I did not expect the results I received from wearing it. I had trigger finger and could not move my right thumb at all. The doctor told me I would need surgery, however after wearing the first bracelet for 2 weeks my thumb started moving again, and by the end of 6 weeks it was back to normal. I lost my first bracelet, this one is a replacement. I'm a believer and wear mine all the time now!! Great product! Bob re-sized without any hassle. Looks great... Thanks! I liked the looks of this bracelet on the Web and after receiving it I was very pleased with the quality and the size was just perfect also. When I put it on it actually felt heavy to me for the first day or so. Needless to say I LOVE it. I love the stainless steel style. Fits perfectly. Love the fact that I can wear it 24/7, and I don't have arthritis pain now. I have ordered one of these bracelets for my ankle and also a wrist bracelet for my husband. I was surprised how my bracelet takes the edge off the pain in my thumb, its not totally gone but I haven't had to take an Aleve since I've been wearing it. A classy looking bracelet. I wear it all the time and I think it has helped by shoulder & given me more energy. The company website was easy to navaigate. I had a question about how to measure correctly. I left a phone message & was called back in a timely manner. I would definitely buy from them again. This is a very attractive bracelet. I bought it to help relieve my carpal tunnel symptoms and have noticed a difference. I was worried that I may have measured my wrist incorrectly but turns out I didn't, it fits perfectly. Definitely true to wrist size. I like that it is stainless steel and I won't have to worry about it tarnishing. I've told others about this great product and website. Thank you!! It is very difficult for me. The clasp is too hard to open, I am 87+ years of age, live alone and don't have much strength in my hands. I finally got it open to put on, and now I haven't been able to remove it. Reply by MJS: A tight clasp is normally a good thing. Glad we were able to contact you and advise how to easily open and close. i had to get bracelet sized but my fault.i love it i can feel pain relief. will order anklet later.it looks good on my arm. thank you. Reply by MJS: We are always glad to re-size for you if needed. I love this bracelet! I was surprised at how pretty it is. I've been wearing it now for two weeks and I do think it is helping the aches and pains. Even if it wouldn't be working I'd wear this bracelet all the time! I am thrilled with the purchase I made. This bracelet is very stylish and I wear it everyday! I have noticed a difference in my fibromyalgia pain! Thank you so much!!! Finally a bracelet that fits perfectly! Non-tarnishing or color changing is a bonus for me. Have worn magnetic bracelets for several years but find these work better due to how they fit for my carpal tunnel and are they pretty too. It works! No more numb fingers while driving, no more waking up in the middle of the night with a numb hand! It only comes off when I shower! It looks pretty too. People don't even realize it's magnetic, they compliment me on my by beautiful bracelet! This bracelet is very delicate and light. I wear it on the same wrist as my watch and it doesn't feel bulky or cumbersome. Beautiful bracelet that serves duel purposes; stylish and therapeutic! I love my bracelet. I ordered it a little to big but I still love it. Reply by MJS: We are glad to re-size for you. Although it is a very cute bracelet, it has not helped me at all. I've worn it for 2 weeks now and see no difference in my elbow. I felt it was worth a try because it was not expensive; and if it didn't work, I at least have a cute bracelet to wear. Reply by MJS: Have you read the enclosed instructions? DO you wear it all the time? If so, take off for a week and then try again. I bought this for my mother in law and she says she feels so much better since wearing it. The braclet was a Christmas gift and she lover it. with Bob- he sent a link bracelet that fit. I LOVE it! It fits great! All this was because of BOB- He is the best and actually cares about his customers. KUDOS TO BOB!!! Just like I said before in my other post, the same holds true verbatim! I love this bracelet. I wear it all the time. When I received it, I was so suprised at the quality of it. It is beautifully made. It looks like white gold or platinum. And, It is helping with the carpal tunnel in my hands. The doctor had me wear a brace on my hand but the bracelet works just as well or better and looks prettier. I have ordered 3 bracelets and will be ordering a 4th one. Love all the different styles. I love my new bracelet, I thought I bought the same size as my last one but this one is a little looser. I Love IT anyway, works great for the pain i get in my arm and shoulder. I purchased 1 for my brother.. he loves it..
Love it! Wont go anywhere else. Thinking about getting my husband one. Very high quality bracelet, stylish and I liked that there are magnets all around the bracelet. I have to say, also an exceptionally great company to do buisness with, especially in this economy. Even covered the shipping.- WOW Thank you so much, will definitely be doing buisness in the future again! Beautiful and helps my pain.